• Class 2G Acme screw threads for a smooth fit and good support. • Removable bushing to allow replacement of screw assembly. 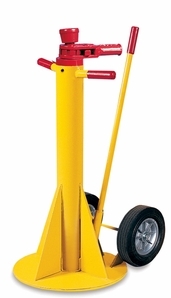 • Swivel head tilts 9" to reduce side load bending force. • Zerk fitting provides uniform and constant lubrication of screw threads. • Bolt and washer prevent over-extension of screw. • Steel sleeve protects axle.